Synthetic peptide, corresponding to amino acids 200-214 of Mouse CIDE A.
Tissue lysate of murine heart. An approximately 25 kDa band can be detected. Our Abpromise guarantee covers the use of ab8402 in the following tested applications. WB 1/500 - 1/1000. Predicted molecular weight: 25 kDa.Can be blocked with CIDE A peptide (ab8434). Apoptosis is related to many diseases and induced by a family of cell death receptors and their ligands. Cell death signals are transduced by death domain containing adapter molecules and members of the caspase family of proteases. These death signals finally cause the degradation of chromosomal DNA by activated DNase. DFF45/ICARD has been identified as inhibitor of caspase activated DNase DFF40/CAD. DFF45 related proteins CIDE A and CIDE B (for cell death inducing DFF like effector A and B) were recently identified. CIDE contains a new type of domain termed CIDE N, which has high homology with the regulatory domains of DFF45/ICAD and DFF40/CAD. Expression of CIDE A induces DNA fragmentation and activates apoptosis, which is inhibited by DFF45. CIDE A is a DFF45 inhibitable effector that promotes cell death and DNA fragmentation. CIDE A is expressed in many tissues. Nuclear. Cytoplasm; mitochondrial envelope; lipid droplet. 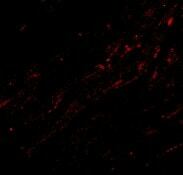 Immunofluorescence of CIDE-A in Mouse Heart cells using ab8402 at 20 ug/ml. Publishing research using ab8402? Please let us know so that we can cite the reference in this datasheet. There are currently no Customer reviews or Questions for ab8402.